CLIcompanion is an application that is used as a compliment to the Terminal. People unfamiliar with the Terminal will find CLIcompanion a useful way to become acquainted with the Terminal. 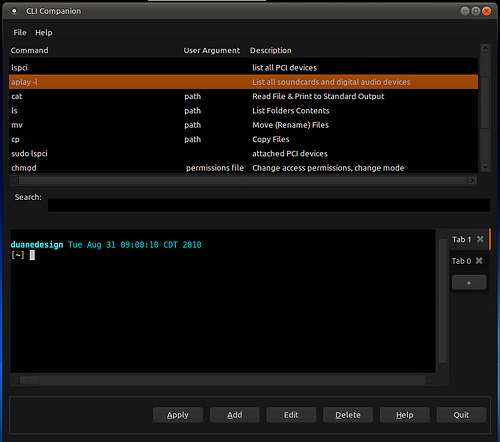 Using the built-in commands new users can unlock the potential of the Terminal. Experienced users can use CLIcompanion’s add command feature to build a command dictionary. Store commands as you come across them and no more do you have to search for them. Note: The PPA is for development version and can be used now. The stable version will be released under a new PPA.